Started by tallpine - April 1, 2019, 7:58 p.m.
Are you sure you want to delete this post: 2019 July Corn April 1st.? Re: 2019 July Corn April 1st. By silverspiker - April 1, 2019, 8:22 p.m.
..... am I the "only" 3,333 lb. flying buffalo in the room ??? .... or is it just me .... ??? Are you sure you want to delete this post: Re: 2019 July Corn April 1st.? Re: Re: 2019 July Corn April 1st. 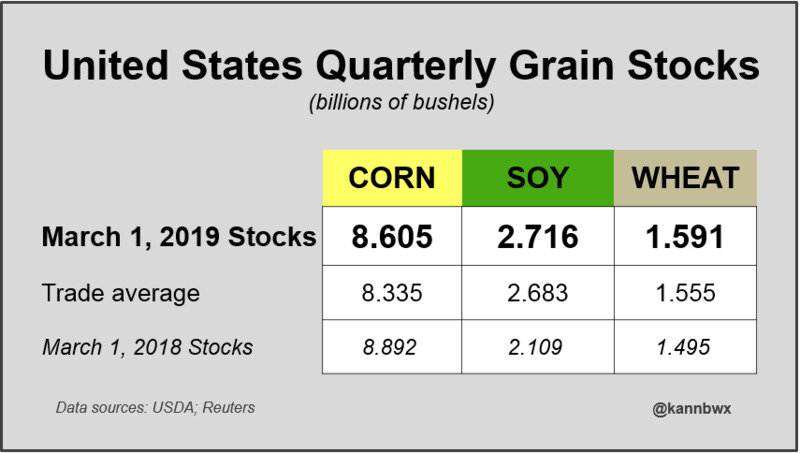 By metmike - April 2, 2019, 12:16 a.m.
Are you sure you want to delete this post: Re: Re: 2019 July Corn April 1st.? Re: Re: Re: 2019 July Corn April 1st. By metmike - April 2, 2019, 12:20 a.m. The NWS updates these products below once a day, after 2pm based on all the guidance/models. As long as we stay wet, the weather has a chance to support corn. On weekends, the maps are automated. Are you sure you want to delete this post: Re: Re: Re: 2019 July Corn April 1st.? Re: Re: Re: Re: 2019 July Corn April 1st. By metmike - April 2, 2019, 12:38 a.m.
Winter wheat rated 56% Good/Excellent vs 32% last year. The 2018 rating was one of the worst ever because of the S.Plains drought. This years ratings were about what was expected. The SRW crop is not doing so well in some places. Ohio ratings were 26% p/vp for instance. In contrast to last year, the HRW is doing much better. NE for instance, where we've been hearing about all the record flooding..........is doing pretty good. Only 5% p/vp and 69% gd/ex in Nebraska. Too early to report on corn planted but it would probably be in the very low single digits. The south has been drying out recently.......note all the brown on the 2nd map, which represents the change from a month ago. Are you sure you want to delete this post: Re: Re: Re: Re: 2019 July Corn April 1st.? Re: Re: Re: Re: Re: 2019 July Corn April 1st. By metmike - April 2, 2019, 10:10 a.m. Grain stocks and planted acres for Corn were both extremely bearish last Friday. Are you sure you want to delete this post: Re: Re: Re: Re: Re: 2019 July Corn April 1st.? Re: Re: Re: Re: Re: Re: Re: 2019 July Corn April 1st. By mcfarm - April 4, 2019, 3:50 p.m.
Are you sure you want to delete this post: Re: Re: Re: Re: Re: Re: Re: 2019 July Corn April 1st.? Re: Re: Re: Re: Re: Re: Re: Re: 2019 July Corn April 1st. By metmike - April 5, 2019, 8:11 p.m.
Are you sure you want to delete this post: Re: Re: Re: Re: Re: Re: Re: Re: 2019 July Corn April 1st.? By metmike - April 5, 2019, 8:12 p.m.
By metmike - April 8, 2019, 1:12 p.m.
As mentioned in the last 3 days of weather updates. 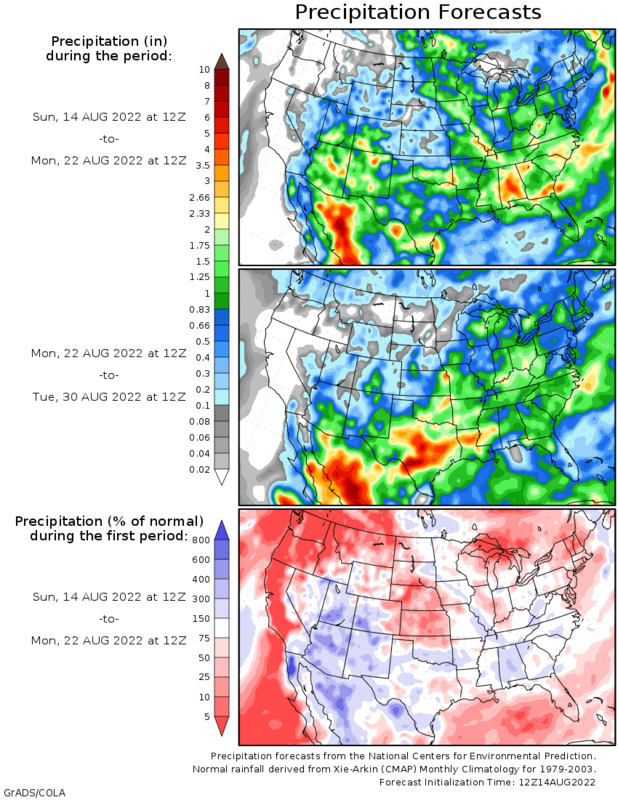 the amount of precip in the forecasts has been drying up and becoming more bearish for corn. The main bullish item is probably this huge snowstorm coming up...........but that snow will melt and the extended weather is looking much drier and we still have a month to dry out before planting in timely fashion. 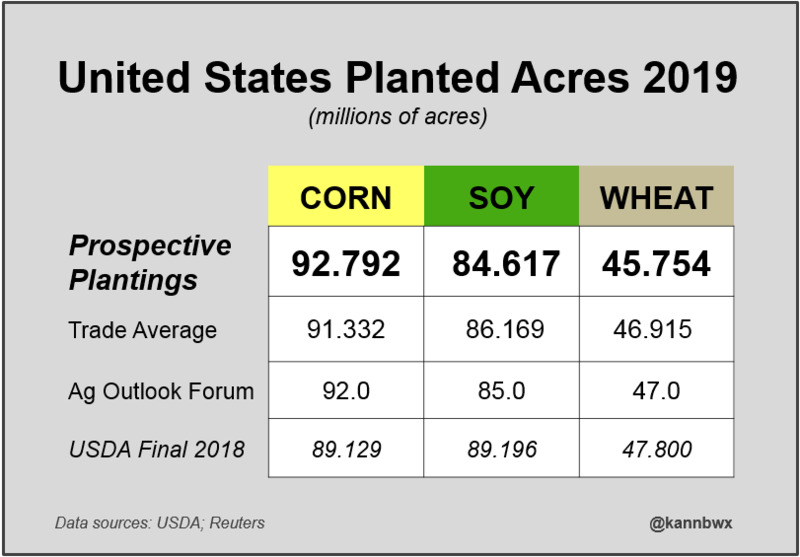 By metmike - April 8, 2019, 1:15 p.m.
Up a bit for both beans and wheat. Down a bit for corn. By metmike - April 8, 2019, 2:21 p.m. It doesn't matter this early but it has been pretty dry in the south, so maybe a bit of corn got planted down there but its hard to imagine that anything at all was planted in the main belt. Average for this time of year is just 2%. By metmike - April 8, 2019, 4:17 p.m.
Corn 2% planted. Still too early to matter. Winter wheat conditions improved by 4% in the gd/ex category. Wow. Now 60% gd/ex vs just 30% gd/ex last year. By silverspiker - April 8, 2019, 5:35 p.m.
By metmike - April 9, 2019, 3:22 p.m.
By becker - April 9, 2019, 11:03 p.m.
Take a look at DBA chart, the ag etf. Looks like the ag sector is caught fire and climbing wall already. By metmike - April 11, 2019, 3:56 p.m.
By metmike - April 13, 2019, 6:14 p.m.
By metmike - April 14, 2019, 5:35 p.m.
By metmike - April 14, 2019, 5:46 p.m.
Re: Re: Re: Re: Re: Re: 2019 July Corn April 1st. Are you sure you want to delete this post: Re: Re: Re: Re: Re: Re: 2019 July Corn April 1st. ?